My husband and I have been working on a new baking blog together — I make treats and write the posts; he takes the pictures — so these days I’ve been baking a lot. I scour baking websites, blogs and cookbooks for inspiration. The other day, I came across an article that listed brown butter as the top way to take your baking to the next level. I’d heard of using brown butter to make savory sauces extra-special. But I didn't realize that browning your butter is one tip almost universally agreed upon by the big-time bakers. It works well with almost any recipe, though I like it best in sweets that benefit from a little nuttiness. You can use it melted, or let it cool and cream it with sugar for cookies, cakes or muffins. Yes, it’s an extra step. But it's easy and totally worth it. Here's how you do it: Gather a light-colored, heavy-bottomed pan, a rubber spatula and all the butter you need for your recipe (in this case, one stick). Melt the butter in the pan on low heat, using the spatula to stir continuously. When the butter gets to 212 degrees, it will start to bubble and hiss as the water evaporates. Keep stirring! And keep the heat on low. This will give you a better chance of catching the butter at the perfect moment — browned but not yet burned. When the water has cooked off, the butter will get very foamy. Pay close attention now because the browning happens very quickly. Keep stirring! Use the spatula to scrape down the edges and around the bottom of the pan to keep any bits from sticking and burning. This is where the light-colored pan helps out — you can see the color of the butter as it browns. You want the liquid to be a rich golden color, with darker brown milk solids that look like fine crumbs. When your butter is perfectly browned, take it off the heat and use it right away, or cool it first if you need it to be more solid for creaming with sugar. For these muffins, I cooled the butter right in the pan I'd used for browning. I covered it loosely with plastic wrap and popped it in the fridge for 30 minutes; it was perfect. The following is a variation on the banana-bread recipe I inherited from my mom, who inherited it from her mom. Enjoy! 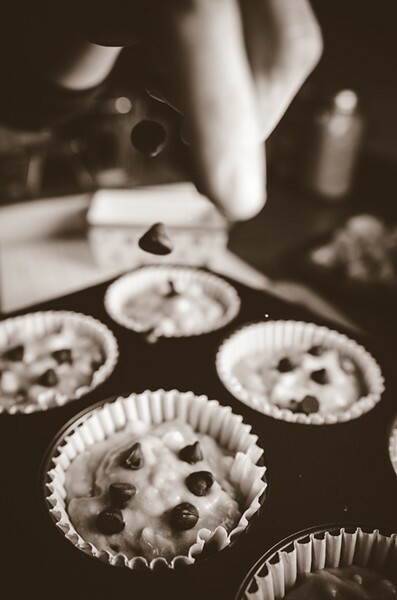 Preheat your oven to 350 degrees and line a 12-cup muffin pan with paper liners. Combine the flour, salt and baking soda in a medium mixing bowl. In a large mixing bowl, cream the cooled browned butter and sugar until smooth. Add the eggs, buttermilk and vanilla and mix until smooth and well combined. Add the mashed bananas and mix well. At this point, you can fold in any extras you’d like to add. 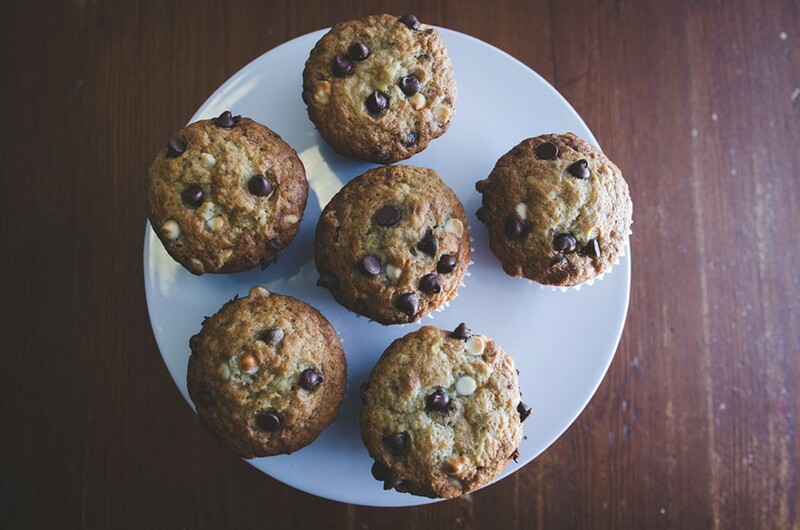 Chocolate chips (milk, white or dark) or nuts work very well. I used semi-sweet and white chips, and they were delish. 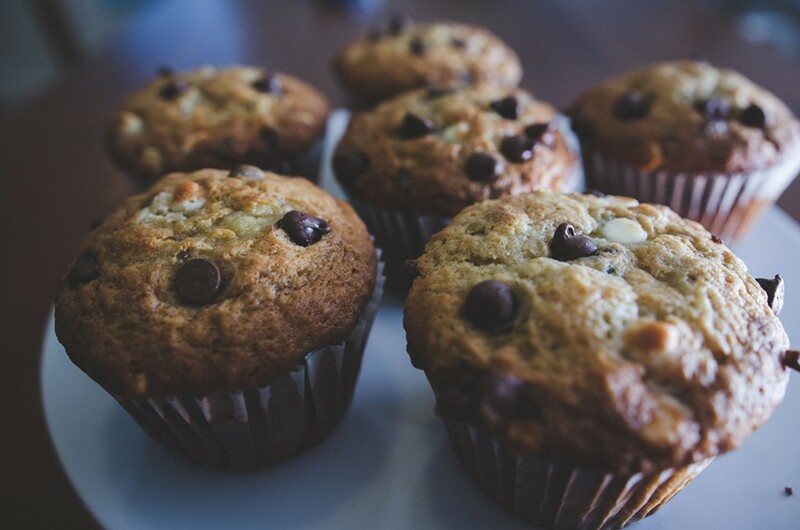 Divide the mixture among the muffin cups and bake for 30 minutes. If your oven runs hot (like mine does) take a look after about 25 minutes. They’re done when the tops are crusty and light brown. If you're not sure, stick a toothpick into the center. If it comes out clean, you’re good to go.